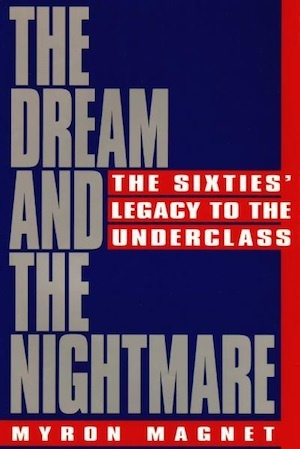 Myron Magnet’s The Dream and the Nightmare argues that the radical transformation of American culture that took place in the 1960s brought today’s underclass — overwhelmingly urban, dismayingly minority — into existence. Lifestyle experimentation among the white middle class produced often catastrophic changes in attitudes toward marriage and parenting, the work ethic and dependency in those at the bottom of the social ladder, and closed down their exits to the middle class. This entry was posted in Books and tagged The Dream and the Nightmare. Bookmark the permalink. Mr. Magnet, “The Dream” book is amazing. Look at where we are now! I use a computer at the Drake Univ. library in Des Moines. These students and faculty and beyond reaching. But you know, I grew up upper middle class (born 1955) and much of what you talk about was communicated to my generation in Deerfield, IL, also. Of course, my family was Democratic. So many peers ended up debauched and dead too soon (including my brother), or just a bunch of money chasers. No soul to be found anywhere. Trump needs to encourage the founding of REAL education. Not just for kids, but new colleges and universities. The ones we have now are hopeless. Thanks for your wonderful work. I was spellbound.